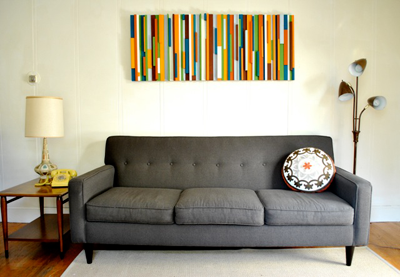 Janine at Salvage Love has posted a tutorial for the DIY wall art she made for her living room. 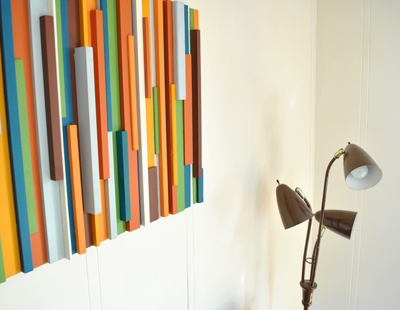 She snatched up a pile of leftover wood scraps from her dad and transformed them into this! Learn how right here. You don't have to paint yours orange, but I highly recommend it. But I love YOU more! Wow. You're in a mooshy mood today. :) Love you too, Mum. That's 'cuz I got an email late last night saying somebody was bringing good food for the weekend. I plan to have a great time! Wow! Sometimes I feel pretty good about the DIY projects I blog about (today - a DIY chalkboard knife block) and then I see something like this. That is an amazing idea and it looks so beautiful and mod. Definitely going to check out the how-to. I love this! The texture and 3D effect of it makes it so much more interesting. That looks amazing, and I've been looking for something like that for my living room -- but the links seem not to work. I am having some server issues this morning, working on it and the site should be functional ASAP. Thank you for checking it out! You know, the posts you do are interesting and all, but I keep coming back for the conversations you and your mum have in the comments. You two are adorable!!! Well, YOU are adorable, too, of course. Mum: Oh Jess, I love you tons and I'm so proud. Jess: Mom, stop it. You're embarrassing. Mum: I don't care. I love to embarrass you in front of tons of people. Seriously, I worry people are going to throw up some day. I think it's possible she just enjoys making me squirm. 'Most' people are prob'ly sick of me, anyway. Nope. Everybody wishes they had a mom that loves them so much. You don't have to stop. I think it's your job to write mooshy comments. You can't help it; you're a mom. Ha ha - I've never given my mum my blog address but I'm reconsidering now...! My INTENDED comment, though, was just along the lines of how cool this is - thanks for sharing! Greetings from Finland! First time here and looking good! I really like that wood-thing... how simple and still beautiful. First of all, this wood wall art ROCKS! And of course it would require orange. I'm going to try this one. Mark has bunches of scraps from work. Yay! Oh, and the reason I now am friends with you mother and have met her in person was solely and strictly because of your comment conversations. Dude! I have so many of these lying around from my husband's unfinished-going-on-four-years bar in our basement. (No, I'm not kidding.) Putting this on my to-do list. Some day! Definitely a fan. I also love the pillow! Love it! What an amazing project! Oh! Great idea! Thanks for your inspiration! Love the colors. They instantly brightens the room. I was looking for something for my apartment. Great idea! The link no longer works. �� could someone who still have this DIY please share it. This looks like such a fun project and it looks awesome! Janine you're so crafty!